To mark the beginning of Holy Week, all are invited to this moving concert presented by our choir, The St. Augustine Chamber Singers. They will be singing John Rutter's Requiem, a musical setting of parts of the Latin Requiem Mass with additional biblical verses and psalms in English. Friends and family are welcome! Tickets: $10 donation at the door, free for students. John Rutter composed this seven-movement Requiem in 1985, a year following his father's death. It is traditional in its inspiration, using Latin texts from the Requiem Mass which are interspersed with biblical verses and psalms in English from the 1662 Book of Common Prayer. It includes heart-felt settings of Psalm 130, Out of the Deep, and Psalm 23, The Lord is my Shepherd. Critics rave that "gloriously pure Pie Jesu is a real highlight – as is the Requiem Aeternam." 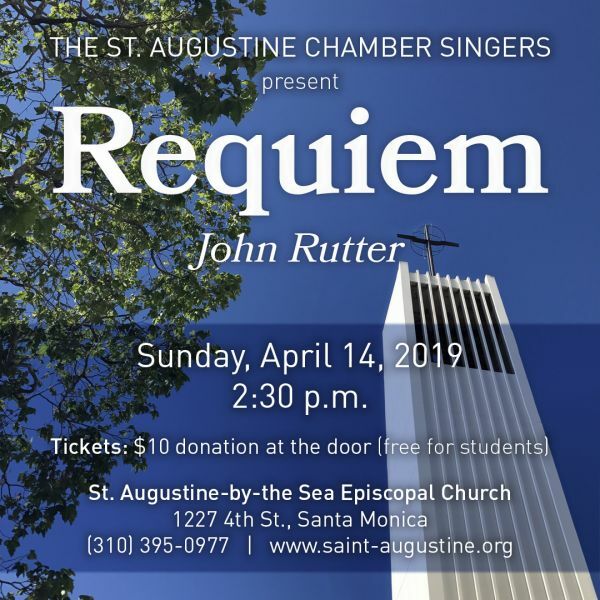 Performed regularly across the world, Rutter’s Requiem is one of the most popular compositions of the last thirty years.